WASHINGTON — Top Democratic presidential candidates on Monday called for abolishing the Electoral College, allowing felons to vote, and requiring cabinet secretaries to hold monthly town hall meetings. 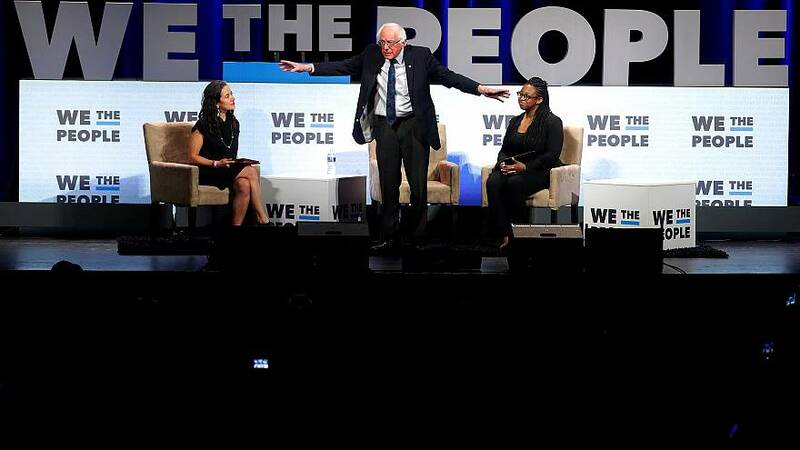 In the historic Warner Theatre in downtown Washington, the We the People summit — a forum focused on so-called democracy issues — offered eight candidates a chance to speak one-at-a-time to progressive activists representing labor unions, the Sierra Club, Planned Parenthood, and other groups. The candidates argued that little progress will be made on any issue without fundamental changes to a political system they called broken and corrupt. "We may get a piece or two here and there, but if we want big systematic change, it's going to mean attacking the corruption head on," said Sen. Elizabeth Warren, D-Mass., touting her sweeping ethics bill that would "ending lobbying as we know it." Other ideas floated included making Election Day a holiday to boost participation, publicly funding campaigns, and giving statehood — and thus two senators — to the heavily Democratic District of Columbia. Former Rep. Beto O'Rourke rolled out one of his first discrete policy ideas at the forum, saying he would make cabinet secretaries in his prospective administration hold public town hall meetings every month. "To listen to you, and to be accountable to you, so that we deliver for you," O'Rourke said, who held monthly town halls as a member of Congress. He, like Julián Castro and other candidates, also called for changing the way presidents are elected. "Yes, let's abolish the Electoral College," O'Rourke said. "If we got rid of the Electoral College, we'd get a little bit closer to one person, one vote in the United States of America." Sen. Kirsten Gillibrand, D-N.Y., mentioned that earlier that day before arriving at the forum, she introduced legislation that would abolish the Electoral College. O'Rourke, Warren, and other candidates also forcefully rejected the influence of money in politics, and called for constitutional amendments to overturn the Supreme Court's Citizens United decision, which allowed for the creation of super PACs, and to guarantee voting rights. Union members, immigrant rights activists and others traveled from all over the country to be here, some bringing young children and many wearing colorful shirts to identify them as members of a certain union or advocacy group. "I always say we have the military to protect ourselves from other countries, but who is going to protect us against our own country? These protesters are soldiers for the people and by the people," said Alethea Shapiro, a mother of four from Long Island who said she had never been involved in politics until President Donald Trump's election turned her into an activist. Organizers of the forum told the audience they wanted to press the candidates on progressive issues, but in a friendly way — "we're about glitter, not shade," as one emcee instructed the audience. Every candidate received a warm reception, with no obvious boos or disruptions, though Sanders and Warren earned the most applause. Sen. Amy Klobuchar, D-Minn., said Republicans often prioritize cracking down on voting rights when they take office because they know it means more political power for them. She said Democrats should do the same. "Every time we take over a state legislature or a governor's race, we should change the laws to make it easier for people to vote," Klobuchar said. But some candidates drew the line against some of the biggest proposed structural changes, like packing the Supreme Court or abolishing the filibuster in the Senate, a procedural move that allows the party in the minority to block legislation. Sen. Bernie Sanders, I-Vt., said he does not support expanding the size of the Supreme Court, as a growing number of progressives have advocated, which would allow a Democratic president to tilt the ideological balance of the court back in their favor. "My worry is that the next time the Republicans are in power, they'll do the same thing," Sanders said. But he said he was open to other ideas, such as term limits for judges or rotating members of the Appellate Courts through the Supreme Court in order to bring in "new blood." Sen. Cory Booker, D-N.J., gave his most vocal defense yet of the filibuster, which candidates like Washington Gov. Jay Inslee and others have called for eliminating, since Democrats will have a hard time winning back the Senate in 2020. As "the only candidate in this race living in a predominantly black and brown inner-city neighborhood," Booker said he worries what unchecked Republican power could do to marginalized communities. "I feel that same sense of urgency," Booker said. "But let me tell you what I worry about. In my community, if Mitch McConnell, Paul Ryan, and Donald Trump had two years like they just had without me in the Senate and other noble progressives who fought them with you to prevent the taking away of healthcare, we would have lost that battle — Obamacare would have been gone." Gillibrand, too, expressed concern over eliminating the filibuster, telling the crowd that if elected president she "will absolutely consider this issue" but warning that "we have a risk that if you are for this today, it may be done before you have the majority." Raul Marquez, a 19-year-old from Salem, Oregon, said that he was glad candidates are thinking big as he plans to participate in his first presidential election. "There is much more at stake than just this presidential election," he said. "I think it was nice and provided some closure in knowing that most of the candidates are feeling like, you know, that is the case."